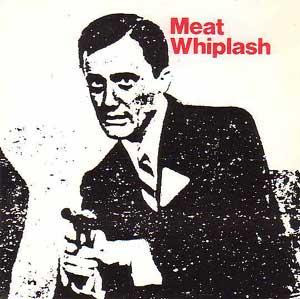 Lightning's Girl: Meat Whiplash - Don't Slip Up 7"
Title - Don't Slip Up b/w Here it Comes 7"
Meatwhiplash were one of the first bands to sign to Creation Records and released but one single "Don't Slip Up" in 1985. The record sleeve is rumored to have been hand folded by Alan McGee himself and the cover art is said to be printed by Bobby Gillespie of Primal Scream. Aside from sounding very much like the more well known Jesus and Mary Chain, the band opened for them at the now infamous North London Polytech show that ended in a total riot. As legend has it, the venue was packed beyond capacity and Meat Whiplash in the supporting slot threw a bottle back into the crowd after it had been launched at them on stage by a member of the audience. The energy of the room boiled over to the point of chaos so by the time Jesus and Mary Chain took stage, the fans began to trash the venue as well as the band's gear. Post riot 4 people were taken to the hospital and over $8,000.00 worth of damage was caused. As short lived as Meat Whiplash band history is, this one and only single from them is about as good as it gets- both sides just as noisy and delicious as any Jesus and Mary Chain single. In 1987 Meat Whiplash went on to form a new band called The Motorcycle Boy that featured Alex Taylor of The Shop Assistants and were promptly signed to Rough Trade. Eventually the band ended up on Chrysalis Records but never gained genuine popularity even though the press gave them a great deal of attention. The Motorcycle Boy broke up in 1990. I have posted the Meat Whiplash music here and below is a bit about the Jesus and Mary Chain riot. Apparently the single was produced by William Reid too although it's not known how true that is.